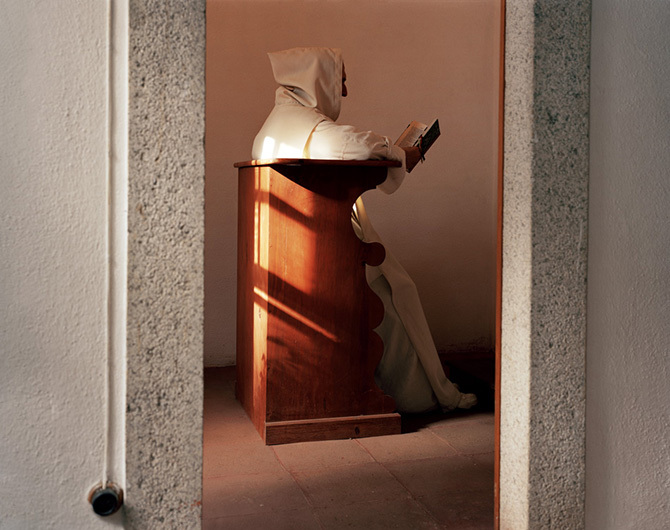 I was one of three photographers (the others, Jose M. Rodrigues and Paulo Catrica, are both Portuguese) commissioned to document the activities of the Eugenio de Almeida Foundation, in Evora, Portugal. The city of Evora, a world heritage site, is located in the heart of the Alantejo province, famous for wine and cork production, but also one of the most impoverished regions in Europe. It is no coincidence that the resulting Trilogia exhibition, featuring the work of the three of us, was shown alongside a reworking of the American Farm Security Administration (FSA) photographs, a government sponsored documentary of the dustbowl of mid-west America in the early 1930s. In Portugal a series of droughts has slowly turned Alentejo into Portugal's own 'dustbowl'. Vasco Maria Eugenio de Almeida, the Count of Vilalva (1913-75), a wealthy member of the Portuguese aristocracy, was an enlightened benefactor of the region. Based in Evora, the Foundation he created had, and still has, spiritual, cultural and educational aims. It's activities include vineyards and the production of wine, urban renewal and the provision of housing for the foundations employees, it's own social security, and the restoration of art works and religious buildings.